Third-year Peter Leung connects with a volley. 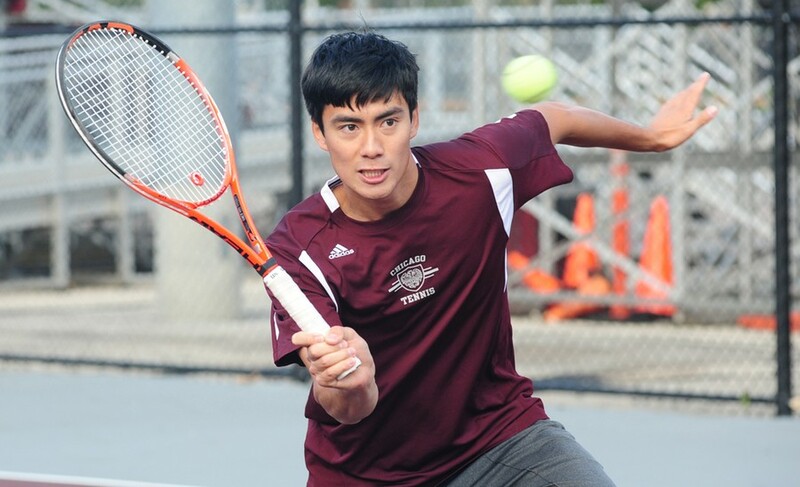 The Maroons’ tennis programs are rounding out their fall season as the UChicago men’s team is sending three individuals to the Oracle Intercollegiate Tennis Association (ITA) Cup. The Oracle ITA Cup consists of eight regional winners in both singles and doubles. The Chicago men’s squad swept singles and doubles at the Midwest Regionals at Kalamazoo College. The women’s team also dominated the competition only to fall just short, losing tight matches in the finals in both singles and doubles. The dominance displayed by the South Siders was truly unprecedented. At one point at the Midwest Regionals, the Maroons were 33–0, and their first loss came when one member of the team had to play another. The Maroon men also had three teams in the doubles semifinals and three individuals in the singles finals. Third-year David Liu eventually won the 128-man tournament by defeating teammate and classmate Peter Leung 6–3, 6–2. The team of fourth-year Max Hawkins and first-year Tyler Raclin defeated the team of first-years Ninan Kumar and Erik Kerrigan 6–2, 6–2 in another all-Maroon final. The Oracle Cup kicks off on Thursday, October 13, and continues until Sunday, October 16. The singles commenced yesterday but resulted in a loss for Liu, the lone representative for the Maroons. However, the third-year has a chance to take fifth place as he takes on Nikolai Parodi of Claremont-Mudd-Scripps at 8:30 a.m. on Friday. The Oracle Cup concludes an amazing start to the season for the men’s and women’s tennis teams. The tennis teams get back on the court in February in preparation for the ITA DIII Team National Indoor Championships.